Splendor from Ashes evokes emotions that would become etched in your mind forever. From the opening pages, with open vulnerability a woman takes you into her private spaces to intimate to you experiences of raw pain resulting from domestic violence. But ultimately the dust clears and the curtains roll back to unveil the irrepressible spirit of woman made strong by her many breakings. 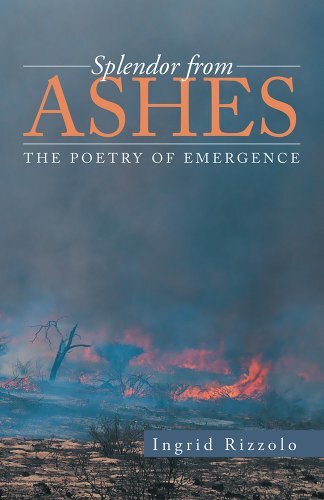 Ingrid Rizzolo chronicles this journey in easily relatable poems in her book Splendor from Ashes. Sounds and looks like a nice book of Poetry. I honestly have not read a book like this but it sounds really nice to read. I have never heard of this but it sounds interesting I will have to look into it! It sounds like it’s an encouraging message in a book. No matter what happens to us, we’re still us, we’re strong and we can rise from the ashes. I am loving the idea of this book! I honestly need to get into the habit of reading again. Oh! You wrote the book?! Awesome sauce. Ingrid, I’m interested in writing a book. I’m thinking about a personal development, self-help, encouragement book. How do I start? What does the process look like? How do I do what you just did? Thank you for any help you can provide. Belinda, thanks for expressing an interest in my book. It’s available on Amazon. This is a great book and I truly love the poems. Domestic violence is something I have dealt with in my past. These poems have so much raw emotion showing the reader the pain but also showing the survivor. Thanks for sharing this amazing book and the awareness. Opening myself like this makes me feel very vulnerable but if it could help someone then it is all worth it. I love hearing reviews from others. Then I can make a smart decision if I want to read a book or not. This one sounds like a keeper! You will certainly be inspired by Splendor from Ashes. Thanks for your kind compliment. This sounds like a powerful book. I think now more than ever we need books like this. It sounds like an encouraging and empowering book for domestic abuse victims. It sounds like a powerful and interesting book to read. I will definitely add this to my booklist to shop. Wow this sounds like quite an intense and real book to read. Very interesting for sure. Wow, this sounds heart-wrenching and transformational. I’m sure to be moved when I read it. Thank you! Once you break free, there is a new road that is so much better. I am happy you have written a book to share that message with other people. I especially like that it’s done through poetry. Thanks for the appreciation you expressed. This sounds like a great book. It would be a perfect gift for a friend of mine. I will have to add it to my Christmas shopping list.